Joji Syed didn’t talk much in high school. But once she came to Northwestern and joined Associated Student Government, Syed said she pushed her own boundaries and stepped out of her comfort zone — to a point where she was comfortable enough to run for ASG president. Syed is running alongside Weinberg sophomore Archit Baskaran. 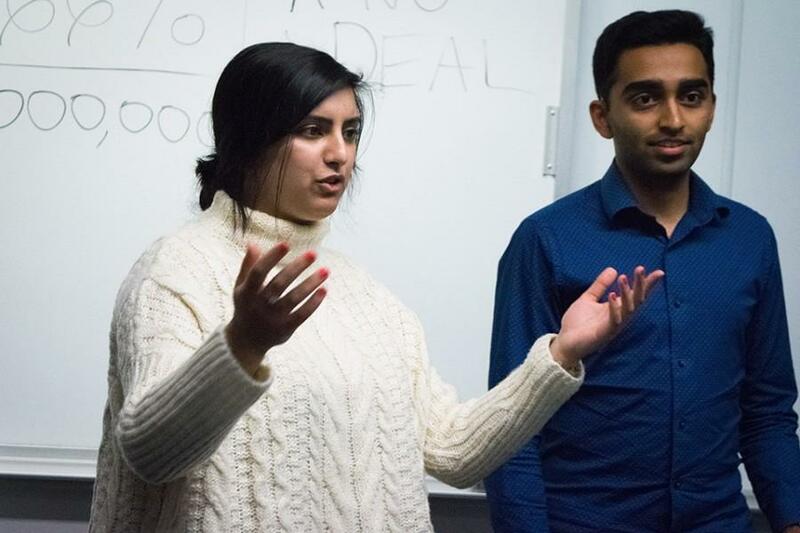 Running with the slogan “A NU Deal,” Syed and Baskaran both stressed that their platform offers something for every student, highlighting the inclusion of marginalized student groups and a “paradigm shift” in ASG that would restore faith in the organization. Syed is the current vice president of community relations and began working with Baskaran when he joined her committee last year. Syed said their engagement with not only student groups but also the larger Evanston community has shaped their perspective about student government’s role as a liaison between students, administrators and the city. The two have proposed changes to the University’s alcohol policy: They want to end the Freshman Freeze, the period during Fall Quarter when freshmen cannot enter on-campus Greek houses, which they said leads to students attending off-campus parties where they may be less safe. They also want to change the rules to permit legal drinking in campus living spaces and allow student groups to register events where alcohol will be present. Along with establishing a “student-led judicial system” that would let a group of students help investigate minor conduct violation cases, Syed and Baskaran said the changes would affect nearly every student. “(Revising alcohol policy is) a very all-encompassing issue which aligns perfectly with our vision of pushing back where is necessary in order to get things done and restoring ASG’s credibility by tackling big-picture issues,” Baskaran said. Baskaran said their platform addresses issues small and large. He said it includes small fixes such as establishing online submissions to the Student Organization Finance Office and larger changes such as shifting the culture of ASG to make its impact more “salient” to the student body. Although Baskaran is a sophomore, he said his underclassman status is actually an advantage because his perspective is often underrepresented in student government and he could show underclassmen that they don’t have to wait to lead. “I don’t see a reason why ASG has to be dominated by a junior or a senior when a sophomore can come into the institution with the same awareness of issues on campus and the same, if not greater, ambition to change the system and overhaul it,” said Baskaran, who is in the Honors Program in Medical Education, NU’s seven-year accelerated medical degree program. Weinberg senior Brad McCandless, who has worked on the campaign after knowing Syed for about two years, said Syed has a grasp of both ASG’s current role and its future potential. “Her personality traits make her exactly what this campus needs in terms of trying to carry through what’s important to students with the assistance in hand of what student government could be,” McCandless said. Syed and Baskaran are running against SESP junior Christina Cilento and McCormick junior Macs Vinson. Voting will begin at 5 p.m. on April 7 and end at the same time the next day.